Posted by Nish on Sunday, February 1st, 2015. Yes that’s right – it’s a website update. They said it would never happen. And by ‘they’ I mean ‘my mother’. 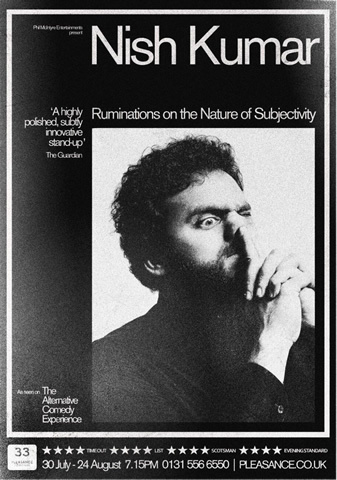 I’m doing some dates around the country of my show ‘Ruminations on the Nature of Subjectivity‘. Yes that is a stupid title. This is a special show as I’m doing Ruminations in the second half and the first half will be a preview of my NEW SHOW. Excitingly I am the host of the Radio 4 Extra show Newsjack. It’s on every Thursday, the first one was yesterday and it’s on for the next five weeks. I’m supporting Milton Jones at the moment on his national tour, in both a comedic and emotional sense. He’s selling out everywhere so Lord knows he doesn’t need my help promoting the shows, so this is just a genuine recommendation – his show is great and I’m honoured to be vaguely involved. But no one tell him I said that because he’ll really bang on about it in the car. More news to follow about New Zealand, the DVD of Ruminations, Edinburgh and some stuff that probably will be of interest to you if you’ve read this far.